Join the Ameriprise Financial Challenge. Ameriprise Financial has committed $250,000 as a matching challenge*. That means your gift today can have DOUBLE the impact. Ameriprise Financial is proud to partner with Feeding America for their Thanksgiving Campaign helping provide food for millions of low–income people struggling with hunger in the United States, including children and seniors. Thank you Ameriprise Financial for bringing more meals to people struggling with hunger. $1 helps provide 10 meals* to those who struggle with hunger in the U.S.
*Every $1 donated to Feeding America helps to secure and distribute at least 10 meals through a nationwide network of member food banks (for FY 19). This meal calculation is updated annually based on fiscal year financial and operational results. 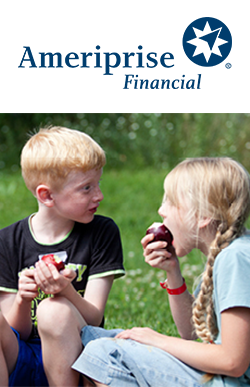 Ameriprise Financial has committed $250,000 to Feeding America. This amount will be used to double the impact of gifts received through select campaigns between now and Thanksgiving. Gifts received after the campaign or in excess of this amount will not be matched but will still help provide food and groceries for those in need.